Meathead Movers is here to take care of the heavy lifting for you on your move to Canoga Park. Our clean-cut student athlete movers are ready to get you safely settled into your new Canoga Park home. No matter where you are moving from, Canoga Park is a great place to make your next home. The right Canoga Park movers can help get your belongings to your new home in one piece. When you hire Meathead Movers for your move to Canoga Park, you will enjoy the benefits of having a highly-trained team of clean-cut student-athletes to handle the heavy lifting for you. Living in Canoga Park gives you the benefits of living close to downtown Los Angeles, while still enjoying a simpler way of life. The series of small creeks that make up part of the Los Angeles River System help contribute to the area’s natural feel. The Los Angeles River actually originates behind Canoga Park High School, and that puts this community on the map in a big way. Residents will love spending the day at the Lanark Recreation Center which has a baseball diamonds, a football field, a kids’ play area and a swimming pool. Residents can also explore nearby Simi Hills to check out some amazing Native American pictographs at Burro Flats Painted Cave. The surrounding area is studded with great attractions so you will never run out of things to do. 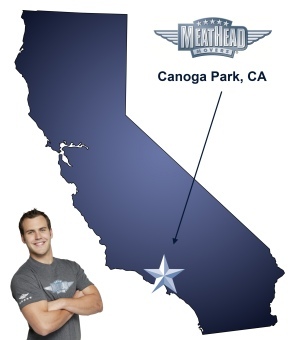 If you are considering a move to Canoga Park, Meathead Movers is here to help. Our moving company specializes in local, long-distance, and commercial moves to, from, and within Canoga Park. We also provide reliable packing, storage, on-site relocations, and our distinctive moving concierge service, which connects you with local service providers. All our student-athlete movers are thoroughly screened and trained before their first move. With branches not just in Canoga Park, but all throughout California, we are your one-stop resource for all your moving needs, no matter where your California move takes you. In fact, you can see what your neighbors in Canoga Park have to say about us. With our 100% satisfaction guarantee, the only thing you have to lose is the stress that comes from moving! So contact us today for a free no-obligation moving quote and to learn how we can help you on your next move! Moving to Canoga Park? Here are some helpful resources. View more Canoga Park resources. Your employees were very professional and very respectful, I didn’t find anything to criticize, they were great !! That was quick and easy and the guys were so awesome! Thanks! !